BitBox - is emerging software package that allows identification, reading and writing internal flash memory of control units for various purposes. 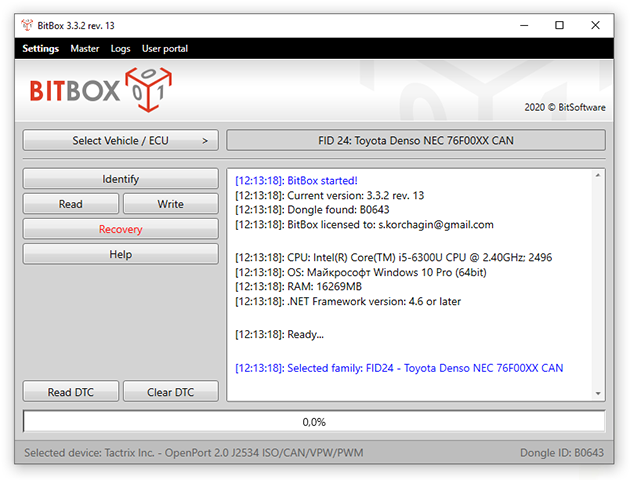 Software working with ECU via the CAN, K-line data interfaces using any J2534 Pass-thru adapter or with Ethernet. Existing modular system allows without excessive cost get an access to needed software functions. The program has a client-server architecture needs to be connected to the Internet. Activation of additional modules is also possible in automatic mode via Internet. All software modules using joint electronic Security dongle. Current carlist you can find here. Also please take your attention to License agreement. BitSoftware team are not responsible for data loss, damages, loss of profits or any other kind of loss while using (or misusing) BitBox or BitEdit software modules. With making purchasing you release us from the responsibility and renounce to all rights to claim any compensation.